Hi, friends! I’m excited because today I’m bringing you a label that will definitely be a new staple in my closet. Reiss is a brand that’s been trusted and respected for over four decades. Their pieces have a distinctly modern yet sophisticated feel that is workplace appropriate but chic enough to fill many other roles in your wardrobe. Reiss is committed to uncompromising creativity, creating styles that never waiver in quality. They have a reputation for their attention to detail and after being able to try several pieces, I’m confident that they live up to that reputation. I’m excited to be bringing you one of my favorite styled looks lately in one of my favorite places – Little Italy in downtown San Diego! So many of my looks are shot here but I don’t often get to talk about it; it’s really become home to me. I love that the historic vibes coexist with an amazing modern feel (and of course, amazing food!). The thing I love about knit tanks like this one is that they make the perfect transition piece between seasons. On warmer, early fall days, throw it on as a statement piece. But when things cool down at night or on cloudy days, throw on a sweater or jacket and you’re good to go. The “elevated tank top” has got to be one of my favorite go-to pieces because it’s easy but not sloppy. Perfect for this San Diego fall where you’re never sure if the sun’s going to come out or not! Can we talk about these boots for a second? They are definitely worthy of a moment in the spotlight. They’re just so good. I love sock booties and I like that this pair still shows off the ankle a bit. They’re super flattering with everything from skinny jeans to skirts. I love the metallic look of these because they aren’t too flashy but they definitely have a feminine edge. They look great styled casually or dressed up and they are a great pair for all those work-to-cocktail hour transitions. 😉 They are seriously so comfortable and easy to walk in with plenty of cushion. I’ve found myself reaching for them even just to run and grab a coffee or dinner with a girlfriend at one of the many amazing restaurants in my neighborhood. How good is this jacket?! This is honestly one of the best blazers I’ve found. The tailoring is beautifully done and I’m in love with the color. After black, green’s got to be my favorite neutral 😉 I can just see this pairing with so many things in my closet already! It’s perfect with these amazing leather leggings, but it would also look great with some distressed denim and a feminine camisole. Last but not least is this gorgeous bag. It’s the perfect touch of effortlessly chic for any outfit and still subtle enough to tote along to the office. 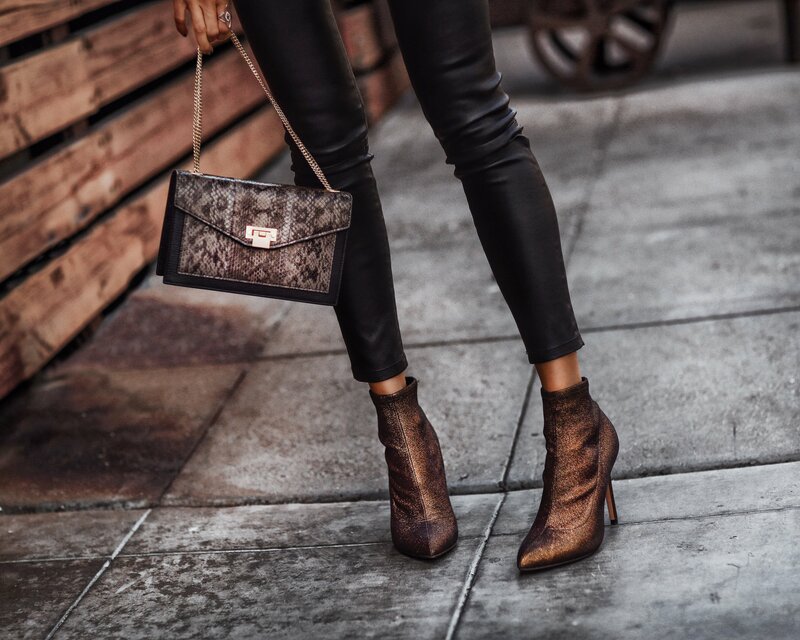 The subtle snake print makes this bag the perfect blend of trendy and chic. Reiss is definitely a label to remember as we take on autumn and your wardrobe needs refreshing. They have classically unique styles that fit perfectly into any closet, no matter where home is! Special thanks to Reiss for partnering on this post. Such pretty pieces … love ♥️it! Can you post the jewelry as well? I love that elegant casual look! That blazer is gorgeous! I’ve been looking for the perfect green blazer!